Trying to squeeze into small enclosed areas, carrying out highly repetitive tasks, retiring with back injuries even while your expertise is needed: these everyday realities of working in aviation construction may become a thing of the past. TMO Trackmotion extends work envelope for Yaskawa MH50 robot on linear 7th axis. 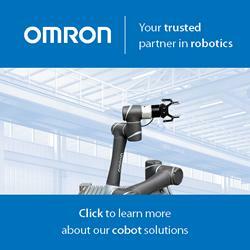 08/25/14, 01:50 PM | Factory Automation, Unmanned & Other Topics | Rockwell Automation, Inc.
08/25/14, 01:49 PM | Factory Automation, Unmanned & Other Topics | Rockwell Automation, Inc. The new ZEISS CONTURA coordinate measuring machines with navigator technology for active sensors allow faster scanning of circular features while also increasing accuracy. CNC turning center from Okuma is ideal for the aerospace industry. Automation System PSS 4000 from Pilz Automation Safety, L.P. These days the quality of the packaging is as important as the packaging lines being multifunctional. Not only must the lines satisfy the very highest requirements in terms of productivity, flexibility and reliability, but safety must also be absolute. 08/21/14, 06:52 AM | Industrial Robotics, Factory Automation | Electromate Inc.
MicroE Systems has recently released it's the new Optical Positioning Sensor (OPS™) Series, which delivers high performance and advanced positioning system features. The OPS™ sensor is equipped with MicroE's patented optical design and features built-in interpolation and AGC ensuring optimal performance and reliability.